Welcome to Nebraska, a land of distinct natural beauty. Prairies extend for miles, pine-covered buttes dot the landscape, endless fields of wheat bend in the breezes, and huge herds of cattle roam on vast grazing lands. It is easy to visualize the Old West in the land of Nebraska. This is the territory of the Pony Express, the Overland Stage, Boot Hill, the Oregon and Mormon Trails. This is where the mighty Missouri flows, and where the Sioux and the Omaha have flourished. This is where historical figures, like Crazy Horse and Chief Red Cloud, Walter Reed, and Lewis and Clark played out the early history of the American West. The stagecoaches and steam locomotives may be gone today, but the days of trappers and traders, of pioneers and explorers, remain in the spirit of Nebraska. The state of Nebraska is actually named after the Platte River from the French meaning "broad river." The Omaha Indians called the river "ibôápka" also meaning "broad river." In 1842, John Charles Frémont used the word Nebraska in referencing the Platte River and this was the name that was given to the territory when it was created in 1854. "The Cornhusker State" officially replaced "The Tree Planters State" in 1945 in recognition of The University of Nebraska football team, the Cornhuskers. It is now more generally associated with all University of Nebraska athletics. It is also said that this nickname refers to the corn that supports Nebraska beef cattle and another state nickname; "The Beef State." "Cornhusker State" appeared on Nebraska license plates from 1969 to 1975. Nebraska National Forest, Largest Hand-planted Forest in U.S.
Officially designated by an act of the Nebraska legislature on April 4, 1895, "The Tree Planters State" nickname was offered as a more fitting representation of the state than others that were in use at the time. This name refers to the millions of trees planted by early Nebraska settlers as windbreaks, orchards and fuel woodlots. Arbor Day was founded in 1872 by J. Sterling Morton of Nebraska City and Nebraska's U.S. Senator Phineas W. Hitchcock introduced the Timber Culture Act in 1873. "The Tree Planters State" was officially replaced by "The Cornhusker State" in 1945. This nickname is in reference to one of Nebraska's main industries; beef. With about 2 million head of beef cows, it's easy to understand why Nebraska is sometimes referred to as "The Beef State." "The Beef State" was carried on Nebraska license plates from the mid-1950s to the mid-1960s. This nickname was given to Nebraska, around 1870, to honor the abundant antelope that graced the state's prairies. An interesting name to say the least. It's said that this reference is to the abundance of bull bats that gobble up insects in the state. These bats are called "bug-eaters" by some Nebraskans. Nebraska was sometimes called "The Blackwater State" because of the rich black Nebraska soil that darkened the streams. People who live in Nebraska or who come from Nebraska are called Nebraskans. The second commemorative quarter-dollar coin released in 2006 honors Nebraska, and is the 37th coin in the United States Mint's 50 State Quarters® Program. Nebraska, nicknamed the "Cornhusker State," was admitted into the Union on March 1, 1867, becoming our Nation's 37th state. Nebraska's quarter depicts an ox-drawn covered wagon carrying pioneers in the foreground and Chimney Rock, the natural wonder that rises from the valley of North Platte River, measuring 445 feet from base to tip. The sun is in full view behind the wagon. The coin also bears the inscriptions "Nebraska," "Chimney Rock" and "1867." 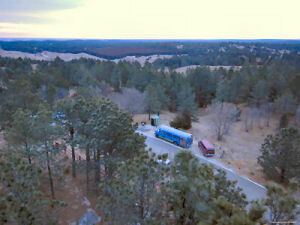 Chimney Rock was designated a National Historic Site on August 9, 1956, and is maintained and operated by the Nebraska State Historical Society. Practically anywhere travelers go in Nebraska they will encounter reminders of America's westward expansion. The state is crisscrossed by the Oregon and Mormon Trails, the Pony Express, the Lewis and Clark Trail, the Texas-Ogallala Trail and the Sidney-Deadwood Trail. The Nebraska State Quarter Design Committee accepted nearly 6,500 quarter design ideas from citizens. Four of these were forwarded to the United States Mint and were used as the basis for narrative designs that were created by United States Mint sculptor-engravers and artists in the United States Mint's Artistic Infusion Program. 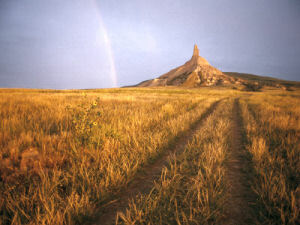 Nebraska Governor Dave Heineman announced his recommendation of "Chimney Rock" on June 1, 2005. The Department of the Treasury approved the design on July 20, 2005. 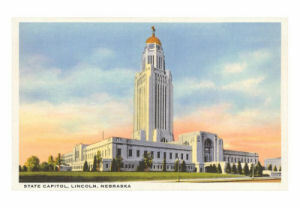 The three other design concepts considered during the final selection process were "The Capitol," featuring a rendition of the architecturally striking State Capitol in Lincoln; "The Sower," depicting the figure that stands atop the Nebraska Capitol, representing Nebraska's standing as an agricultural leader; and "Chief Standing Bear," paying tribute to the Ponca Indian Chief. Nebraska (From Sea to Shining Sea) , by Myra S. Weatherly. 80 pages. Publisher: Children's Press(CT) (September 2003) Reading level: Grades 3-5. Presents information about Nebraska's people, geography, history, landmarks, natural resources, government, state capitol, towns and cities, and more. Nebraska (World Almanac Library of the States) , by Michael E. Flocker. 48 pages. Gareth Stevens Publishing (August 2002) Reading level: Grades 4-6. Filled with the most up-to-date information, including the latest Census results. Full-color photos bring to life the story of Nebraska. In addition to an in-depth factual profile of Nebraska in the form of a state Almanac, this book offers fascinating and lively discussions of the state's history, people, geography, government, economy, culture, and lifestyles. A section on Notable People, a calendar of events, and enough primary source documents, time lines, maps, and other tools to make this unquestionably the best young adult reference material on the USA available anywhere. History of Nebraska , by James C. Olson and Ronald C. Naugle. 506 pages. Publisher: University of Nebraska Press; 3 Sub edition (May 1, 1997) History of Nebraska was originally created to mark the territorial centennial of Nebraska, and revised to coincide with the statehood centennial. This one-volume history quickly became the standard text for the college student and reference for the general reader, unmatched for three generations. This third edition, which has been thoroughly revised and rewritten while preserving the spirit and intelligence of the original, affirms and extends that record. Incorporating the results of thirty years of scholarship and research, the third edition of History of Nebraska gives fuller attention to such topics as the Native American experience in Nebraska and the accomplishments and circumstances of the state's women and minorities. It also provides a historical analysis of the state's dramatic changes in the past thirty years. Roadside History of Nebraska , by Candy Moulton. 416 pages. Publisher: Mountain Press Publishing Company (October 1, 1997) This overview of Nebraska history leads both visitors and residents on an in-depth tour of the state's past. Divided into five geographic divisions, the book follows roadways to all the well-known and many lesser-known points of interest. From early French and Spanish explorers to modern agriculture and the ongoing plight of Native Americans, the complete story of Nebraska unfolds here.